The Web Application Layers diagram illustrates our view for creating optimal web-based applications that are hosted according to the "Application Service Provider" model, in which multiple client businesses can access a common database with their own unique users and groups. Using this structure, WEBAPPZ can provide its clients with a total solution. With our security/user management application, bizDAV and our development frameworks, PDFkit and LISTedit, we can ensure that optimal web application security is achieved, a common graphical user interface is maintained throughout, document printing is consistent and easy, and development time is reduced. 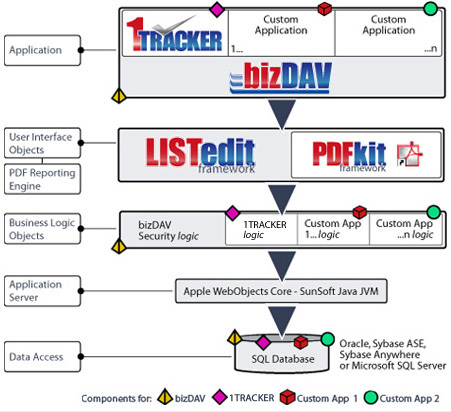 In this diagram, the bizDAV application handles all security layers. An administrator of your business would manage most of the bizDAV configuration, and end users would only use bizDAV to configure their personal settings. LISTedit framework provides the user interface logic. With LISTedit, we can build web-based applications at least 2 to 3 times faster and with much more functionality. Further, with LISTedit, testing is kept to a minimum for the end application since the framework, itself, has been thoroughly tested. End users will find that learning time for a new application is drastically reduced due to the intuitive nature of the user interface. PDFkit framework serves as the reporting engine. This powerful reporting tool ensures consistent document/report printing on any printer. We use this framework, with possible extensions requested by the client, for all dynamically generated reports and graphs in Adobe Acrobat's Portable Document Format (PDF). The Business Logic Objects represent application logic which can be accessed by both the PDFkit and LISTedit frameworks. This is where application logic resides. In the diagram, Custom Applications 1 and 2 represent client-specific applications. The application server layer is WebObjects™ 5.2 or higher running Java 1.4.2 or higher, on the following platforms: Mac OS X, Windows, Solaris, or Linux. The data access layer represents the database server. The following database servers are supported: Microsoft SQL Server 2000, MySQL 3.23.51, Sybase ASE 12.5, Sybase iAnywhere 9, Oracle 8.1.7 & 9.2.0.1, OpenBase 7.0.8, and FrontBase 3.6. Further, since all our applications are accessed through the internet, they can virtually be accessed from any client computer: Windows XP/2000/NT/ME/98, Mac OS X, Linux, and all other flavors of UNIX. We recommend Internet Explorer 6.0 or higher as the browser for all Windows clients and Mozilla 1.6/Netscape 7.0 or higher for the non-Windows clients.